Do you have concrete floors that you’re trying to protect? Whether you manage an industrial garage floor or a large commercial environment, you need a solution for stains, scrapes, cracks, and pitting that often take place on unprotected concrete floors. From caustic chemical spills to foot traffic from heavy machinery, your commercial floors can take a beating. Why not protect them with a chemical resistant floor coating? At Prestige Floor Coating, we can do just that. For chemical resistant floor coating services in Edgewood, Maryland or nearby, contact us today! Why Consider Floor Coating Services in Maryland? Maybe it’s time you looked into chemical resistant floor coating for your business or home. For chemical resistant floor coating services, contact us today. Chemical resistant floor coating from Prestige Floor Coating will provide your concrete floor with the maximum in protection against corrosive chemicals and the stains, cracks, pitting, and other forms of damage these harsh chemicals may cause. Your chemical resistant floor coating will also extend the life of your industrial, warehouse, or commercial floor, or showroom, as well as your work, garage, or storage building. Prestige Floor Coating offers industrial chemical resistant floor coating in various colors and textures to suit your particular business. Contact us to get started! Industrial, manufacturing and commercial showrooms are busy venues. Shifts of employees coming and going as manufacturing is underway, storage of large-scale machinery, and regular foot traffic are common in any business setting. Showrooms, with your company’s products proudly displayed, are essential to many businesses. Disruption in these settings can interrupt your business, costing your precious time and money in production and sales. When your showroom or warehouse floor shows signs of damage, the need for you to repair your floor is immediate. In order to prevent injury to employees and customers, it may become necessary to shut down operations for a time. However, when you protect your floor with chemical resistant floor coating from Prestige, you won’t need to worry again about floor damage, skid prevention, nor time-consuming repairs. Once our chemical resistant floor coating is applied, your protection is immediate. Our experienced team of installation professionals will prepare your floor by repairing any uneven surfaces, cracks, pitting or crevices. Next, we sand the concrete so the product will adhere properly, preventing breeches in your flooring which may allow for dampness to seep in and cause peeling or cracking. Once your floor has been prepped, we begin our multi-layer application, complete with a durable and insulating top-coat. Our process takes roughly 2 to 3 days, depending on the size and scope of your floor. We guarantee your complete satisfaction. After 16 years in the business of protecting floors, our process is impeccable. Our 40 thousand plus satisfied customers will attest to that. Installing and maintaining a chemical resistant floor for your industrial, commercial or residential floor can be a serious interruption to your business. That’s why our maintenance free product is warrantied for life. Once your chemical resistant floor coating is in place, you won’t have to worry about repairs or reapplication. You have the ultimate in protective chemical resistant floor coating from Prestige. 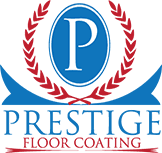 Contact Prestige Floor Coating today to find out how to protect your floors. We provide chemical resistant flooring solutions in Maryland, Northern Virginia, Southern Pennsylvania, and Delaware!